We are still stunned by the terrorist attacks of September 11, 2001. For artists and all those who value the diversity of our lives, understanding this loss is exceptionally difficult. It is hard to comprehend three thousand innocent people killed in one day, not by a natural disaster, but by men who want to destroy the freedom of our way of life. The Memorial Portfolio is not about economic, political or military consequences of terrorism. It is our way to turn the symbolism around. Thousands of people died because this country respects freedom of religion and speech and encourages all individuals to reach their full potential. We celebrate their individuality in that spirit of creativity. We hope our expression of sympathy comforts their families and friends, a nation and the world. 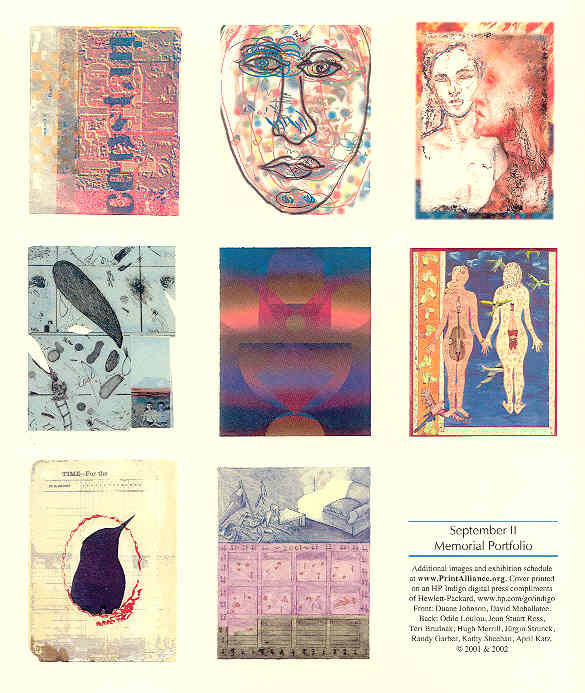 Dr. Carol Pulin, director of the American Print Alliance, started this project by suggesting that we ask each of our artists to create one print to commemorate one person. A memorial portfolio is a way to help us understand the loss of so many individual lives. The Vietnam memorial is eloquent and moving because we read names and, even if we don't recognize any of them, we recognize common first names and last names. They were mostly soldiers and it seems appropriate that the names are carved alike, as in traditional war memorials that stand in town squares around the world. The Oklahoma City memorial for the Murrah Building victims is composed of scattered groups of simple chairs. Some are small chairs for children, but they are otherwise stylized and alike. Although it is a terribly large number, one can grasp 168. But for thousands of people, the artworks have to be different, individual images for the concept to be effective. People will inevitably be drawn to certain pictures: some will spend time with those portraying a scene, others will find meaning in abstract colors. As viewers walk along, they will stop to think about some here and there, be drawn to another down the row, just as they might be intrigued by various faces in a crowd. To convey the sheer number and the individuality of each life is the challenge. Speakers will tell us about acts of courage and compassion, and writers will recount memories of each man, woman and child. We, however, are thankful for the language of art and especially prints. Besides a heritage of responding to social and political needs, we offer an evocation of life that crosses cultural and national boundaries. Representatives from each Alliance council thought deeply about the issues and offered their intense reflections in introspective comments. The initial premise that every artwork submitted would be included in the portfolio because each represented a life shaped our decisions on all the major factors: theme, size, display and media. To encourage all artists to take part, even if their printmaking usually requires complex processes or expensive press time, we accepted other techniques as well as prints (etchings, lithographs, screenprints, woodcuts, etc.). Drawings, watercolors, photographs, handmade paper, all original works of art on or of paper fit in this conceptual portfolio. 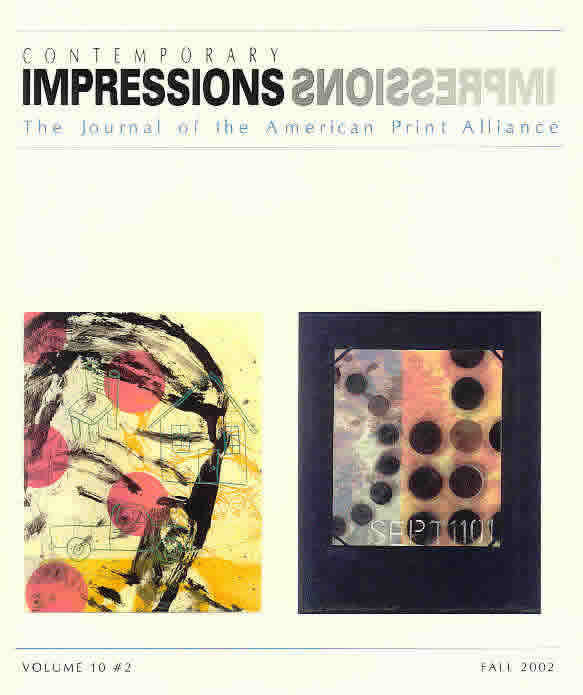 Each contributing artist is a member of an Alliance council or a subscriber to our journal, Contemporary Impressions. The imagery is as distinct as the artists, who range in age from high school students to retirees. They chose to commemorate life with landscapes, figures, city scenes and abstractions. Many responded with expressions of sorrow or of hope. Some artists portrayed the everyday activities and joys of living. Thus, this portfolio is intended to cherish memories of life, with artwork as individual as those who are no longer with us. The scale of the project will unavoidably remind everyone of the number of innocent lives lost. The power of this memorial will come from seeing the actual prints on exhibition in so many communities, demonstrating the role of the arts in all our lives. The size of the artwork and the form of display are more than usually inextricably linked, because they will be seen as symbolizing facets of the theme, affecting the portfolio's emotional power. The initial idea immediately called to mind the office papers raining down on New York City from the damaged towers of the World Trade Center. The standard size of office paper would be an eloquent evocation of that phenomenon, but also an exceptionally disturbing memory of senseless destruction. We wanted to commemorate people, not memorialize acts of violence. So we chose 8 x 10 inches, a size that would still evoke those floating papers, but that we hope will remind viewers more of pictures from a family photo album or pages from an artist's book. Thinking about arranging so many artworks in a simple grid, a format often used in galleries today, led us to refine the display and apply its qualities as a deliberate visual strategy. A grid in this context recalls well known photographic installations by Christian Boltanski, especially those based on the last yearbook from a Jewish high school in Berlin closed in 1938. The formal structure could distance the display from the heart rending photocopied images of the missing posted all over lower Manhattan (and we reminded artists, even those who wanted to create a work about someone they knew personally, to respect the privacy of grieving families). The strings of artwork have an obvious analogy to a clothesline, a very mundane, everyday device in contrast to the enormity of the tragedy. So the display also recalls the Tibetan tradition of printing woodcut prayers and icons on colorful cloth squares and hanging them where the wind will blow their messages to the universe. Many aspects of our world are being challenged, and aesthetic conventions of art are likely to be as well. The Memorial Portfolio will eventually be donated to a museum collection. But it is especially significant to show it first in non traditional places like airports, hospitals and schools, as well as art centers. Here it will touch the lives of people who wouldn't ordinarily think about art, much as the events of September 11 touched so many people who previously wouldn't have thought of themselves as connected to the lives lost. This portfolio was intended to honor individual lives and thereby to create a new legacy from these terrible events. Few of the artists knew a victim personally, but their compassion for strangers reflects a respect for cultural differences. The artworks are exceptional, from very simple to amazingly complex, all heartfelt. March 14 - April 4, 2005. Dadian Gallery, Wesley Theological Seminary, Washington, D.C.